Some people look at clouds for their aesthetic value: beautiful cotton candy pieces lending its magic against the blue sky. But beyond their aesthetic value, clouds are important because they are made up of moisture which necessarily bring rain or precipitation. Rain clouds bring rain. They signal rain fall which are highly important for crops, for the land, and for some animals. We can not deny the importance of hydration in the life cycle and rain clouds play an important role in that. Rain clouds appear like dark and large clouds. They are dark because they carry a significant amount of water droplets. A few amount of sunlight can pass through them as they are massed together formed by water. Rain clouds are very apparent in tropical countries because of the warmer temperature in the atmosphere which expedites the rise of air in the sky, thus forming rain clouds. The most common type of rain cloud is the nimbus cloud. While that may be the case, it is not only the nimbus cloud which brings precipitation as other types of cloud formation such as nimbostratus clouds are also known to bring rain and precipitation, usually characterized by slower and steadier rain fall. 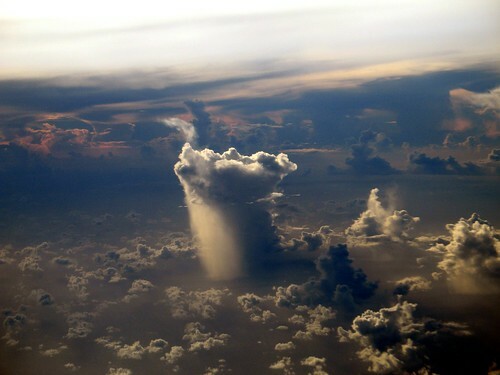 Cumulonimbus clouds also form rain clouds, and can even be the source of heavy rains.